3. Toast marshmallow over open flame using wooden or metal skewers, turning until heated through and golden brown in color. 4. 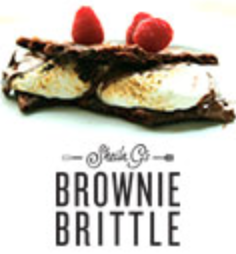 When marshmallow is toasted, place it on the Brownie Brittle that has the chocolate squares on it. If desired, arrange coconut or fresh berries on the marshmallow. Place the remaining piece of brittle on the top. 5. Press together and enjoy! We hope you enjoy this recipe as much as we have!